Disclosure: I received a Spring in Your Step kit which contained a package of Children's Claritin liquid and chewables along with promotional items to pass out to my guests. With spring time comes seasonal allergies. If you are like me and my kids, this can last throughout the summer months. 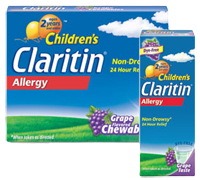 Claritin has an answer for all your children's allergy needs. With Children's Claritin, your child can feel better while playing outdoors without the drowsy side effects that other allergy medication can cause. I know my kids definitely feel better and it is not hard to get them to take the grape chewables. As a Claritin Mom, I participated in the "Spring in Your Step" Moms Meet-up. I was provided with head and sinus packs along with 2013 Preparedness Checklist & Tips to pass out to the moms. Unfortunately, my kit didn't arrive till after the date of my scheduled get-together, so I passed them out at the next get together--a day outdoors at a pool. Fortunately, with Children's Claritin, my girls were able to have fun outdoors! The head and sinus packs were bands that you could put around your head to help relieve a headache. They were pretty cool and the moms liked it. The moms also liked the checklist and one mom took an extra for a friend. It was a nice little bonus for our get-together! I know one mom has a son who suffers from many allergies--including food allergies. So glad my kids don't have food allergies! Here is the 2013 Preparedness Checklist & Tips. 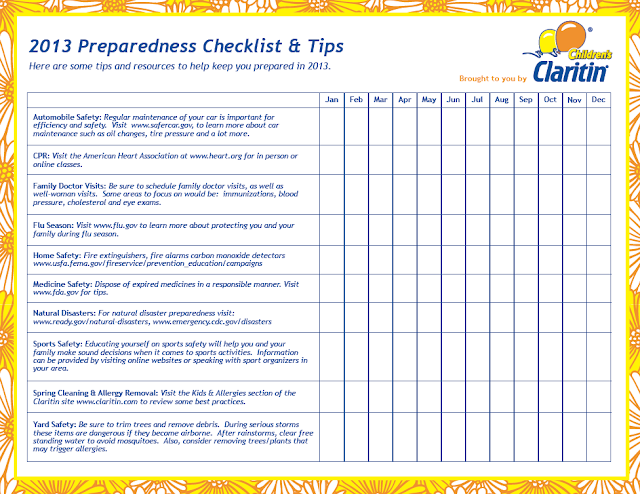 You may want to check it out--some very good and important things to do to be prepared for the year.